The Indian Institute of Management Kozhikode, IIMK is the fifth Indian Institute of Management. Established in 1996 by the Government of India in collaboration with the Government of Kerala, it provides education, training, consulting and research facilities in management. 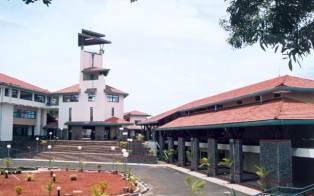 IIMK is located at Kozhikode, in south western India, a location made famous by the entry of Vasco Da Gama to India. The Institute operates from it's own, newly constructed campus, in the scenic ambience of approximately 100 acres in the Kunnamangalam locality of Kozhikode. contribute towards the development of communities of dependable, capable, caring and fair minded individuals. IIMK is dedicated to offering world class programmes in management education. Its academic programmes encompass a range of long term full time diploma programmes such as the Post Graduate Programme in Management, and a number of short duration executive education programmes. The institute endeavours to develop the necessary environment through the synergy of faculty, students, business, industry, and technology. The Learning Resource Center at IIMK (http://intranet.iimk.ac.in/libintra/index.htm) aims at providing state-of-art information resources and value-added information services in all areas of management and related disciplines. Over the years the LIC has registered significant progress and has brought worldwide recognition and laurels to IIMK. The E-Learning Portal developed by the Center for Development of Digital Libraries (CDDL) got accepted by the WHO India Office (http://www.medinfoguide.org). IIMK's ambitious Digital Library project, sponsored by the Ministry of HRD (Govt. of India), received the status of an example collection from the world renowned "Greenstone" family of the University of Waikato, New Zealand, the third institution from India to have bagged this coveted position (http://www.greenstone.org/cgi-bin/library?e=p-en-home-utfZz-8&a=p&p= examples). Another important landmark has been the commissioning of the Smart-Card based Access Control System and the Smart-Gate based E-Security System. The LIC at IIMK is a digital delight, available 24 hours a day, and spans throughout the campus. It is a perfect blend of digital, audio, video and print media with cutting-edge technology. It is an outstanding knowledge-centre catering to the faculty, students and research scholars. It houses several thousands of books in print form, hundreds of print journals, over 30000 e-Books and more than 7000 electronic journals from India and abroad, in addition to as many as 1000 CD-ROM publications on contemporary issues. The audio/visual unit in the LIC hosts over 226 educational videos covering a wide range of disciplines in management. A host of full-text/bibliographic CD-ROM databases on scholarly information coupled with a set of national and international databases on companies, industries and the markets are available to users through a local area network (LAN). The LIC digital catalogue is also available via the LAN. The Library Web Portal is a unique feature of IIMK’s Library & Information Center. The portal is an integrated network of information sources. Besides serving as a web-based interface to the in-house resources, the portal also provides links to strategic sources of information. IIMK is an active member in the IIMs' Library Consortium as well as the Ministry of HRD's INDEST Consortium (http://paniit.iitd.ac.in/indest/).